In traditional photography light is captured chemically and then processed (developed) using chemicals to produce a negative. Light is then passed through the negative on to another chemically treated piece of paper that is then developed in to a photograph (a print). In our digital wedding photography, the same light is captured electronically and then turned into data that can then be read by any computer. Then we can print your images directly from our computers with no loss of quality. Our digital wedding photography bypasses the extra steps, costs and uncertainties of chemicals and film so we can pass the savings along to you. Our digital photo system allows us to make instant corrections so you know your photos will be their best. Instant feedback: lighting, eyes that blinked, glare off of glasses, etc.. There is no wait time with digital pictures so you can look at your images as soon as they are taken and then if there is a problem with the images we can go back right there on the spot and retake your images. With film photography you would have had to wait several days and then just hope that every thing worked out alright (we like to know right on the spot). With our system, you don't have to wait till AFTER your special day (too late!) to catch any problems. Not just ANY digital camera. Not those pocket point-and-shoot, we use professional Nikon digital equipment costing thousands for the best possible results. Our Rockwall Wedding Photography system allows us to display the image on the camera's screen or any television for an instant review of your images. The first major difference is in image reproduction. In traditional photography you get one set of negatives and every image that you print has to come from those negatives and if you lose or scratch that one set of negatives you can no longer print you images. Each photographic print is another process of chemicals and paper, and that is one generation away from the original, so quality is always lost. Not so with our digital wedding photography. Our professional-quality digital advantage allows us to copy your photo data as many time as you want with zero loss of quality - no generation loss. Print your photos anytime and anywhere at will! They remain fresh and vibrant forever. No film to go bad. No negatives to scratch. No images to lose. With film photography, there are lots of problems that could result in the loss or destruction of your images that our digital photography avoids altogether (i.e. film could be bad, problem with the shutter, light could get to your film, damaged or destroyed during development, not processed with the freshest chemicals, etc.). At "Rockwall Wedding Photographer" we have eliminated all the danger areas that plagues film photography, upgrading your photos to our state-of-the-art wedding photo technology to ensure your complete delight! 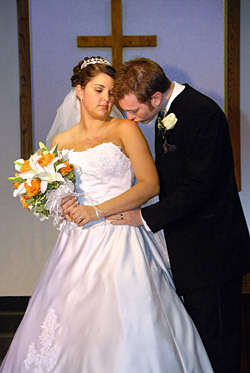 Wedding Photography Rockwall also includes, in each of our wedding packages, a CD of all your photos. This CD master is yours to keep. You can take your CD to any photo store and receive prints of your size at your time. This is the ultimate in flexibility and freedom. Email to friends, make unlimited prints...the choice is yours. Call Rockwall Wedding Photographer at 972-822-3587 to book your date. © 2000-2013. All Rights Reserved. Dallas Wedding Blog. Web Design by Promise Productions USA.